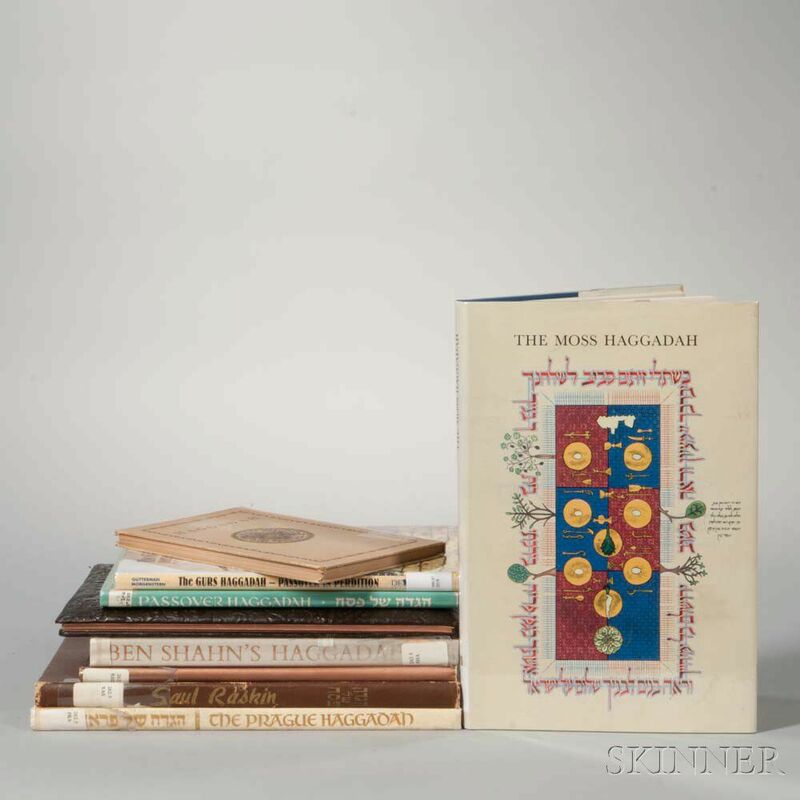 Nine Passover Haggadot, 1930s to 2000s, including: Shahn, Ben, Haggadah for Passover - Copied and Illustrated by Ben Shahn. 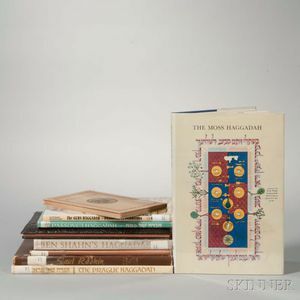 With Translation, Introduction and Historical Notes by Cecil Roth, Boston: Little Brown (1965); Gutterman, Bella and Morgenstern, Naomi, The Gurs Haggadah: Passover in Perdition, Devora Publishing (2003); Moss, David, The Moss Haggadah: A complete reproduction of the Haggadah written and illuminated by David Moss for Richard and Beatrice Levy, with the commentary of the artist (Hebrew and English Edition), Bet Alpha Editions 2000, 3rd edition; Hagadah Shel Pesah: Mi-Bet Defuso Shel Gershom Kohen, Prague, 5287, facsimile, New York: Defus Ha-Ahim Shulzinger (1964); Roth, Cecil, The Haggadah A New Edition with English Translation, Introduction and Notes, The Soncino Press (1934); Regelson, Abraham, The Haggada of Passover with a new translation..., Shilo Publishing, (1941); Raskin, Saul, Haggadah for Passover, New York: Academy Photo Offset (1941); Rotenberg, Beno, Hagada shel Pesah, Tel Aviv: Hotsaat A. Levin-Epstein (1960); Loewy, Dr. Joseph (transl. ); Guens, Joseph (transl. ), Pessach Haggadah: Service for the First Nights of Passover, Tel-Aviv: Sinai Publishing (1955).